This story about science instruction was produced by The Hechinger Report, a nonprofit, independent news organization focused on inequality and innovation in education. Sign up for the Hechinger newsletter. But science has long been given short shrift in the first few years of school. Most elementary school teachers have little scientific background and many say they feel unprepared to teach the subject well, according to a national survey of science and mathematics education conducted by a North Carolina research firm in 2012. Just 44 percent of K-2 teachers felt they were “well prepared” to teach science, according to the survey, compared to 86 percent who felt well prepared to teach reading. Possibly as a result, the average first- through fourth-grade student spent just 2.5 hours per week on science during the 2011-12 school year, the last for which data is available, according to the National Center for Education Statistics. And that could be why just 38 percent fourth grade students performed at or above proficient on the latest National Assessment of Education Progress for science, which was administered in 2015. That’s a problem because careers in science, engineering and math are some of the fastest growing (and best paid) sectors of the American economy. Such jobs made up 6.2 percent of all U.S. employment in 2015, according to the U.S. Department of Commerce, and that’s not counting healthcare jobs, which make up another 9.1 percent. If today’s grade school children aren’t science literate, they’ll have a much bigger hurdle to overcome when they try to enter those fields in the early 2030s. But the Next Generation Science Standards (NGSS), first released in 2013, could be changing all that. The standards, adopted in full by 19 states and the District of Columbia (another 19 states adopted very similar new standards), are meant to help teachers focus on the importance of learning science by conducting experiments, collecting and recording information and evaluating evidence. Getting schools and teachers to begin effectively teaching to the new learning goals is a multi-year process. A new national science test and a new national survey, both due out in 2019, will show whether science achievement has improved and whether time spent on science has increased; in the meantime, the standards are definitely spurring some to action. That’s been true for Redmond, Oregon kindergarten teacher Jennifer Callahan. 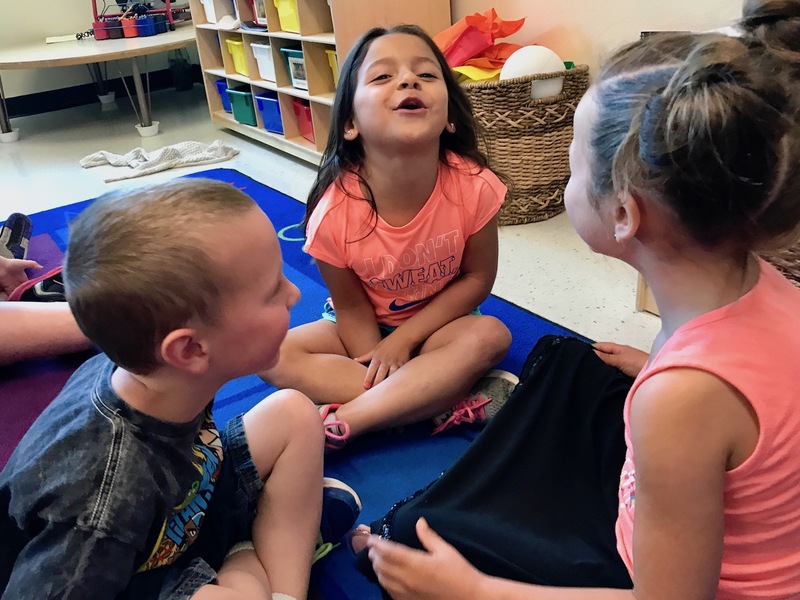 On a Wednesday in May, Callahan’s classroom at the Redmond Early Learning Center, which houses all of the semi-rural district’s 400 kindergartners, was alive with scientific discovery. Callahan’s students were arrayed in a big circle rolling a ball across the rug to various classmates. After each roll, Callahan asked if it had taken a strong force or a gentle force to move the ball. Kids answered with a hand signal — one hand petting the other for gentle, a flexed bicep for strong — then explained their answer to their partner before Callahan called on a student to say what he or she thought. 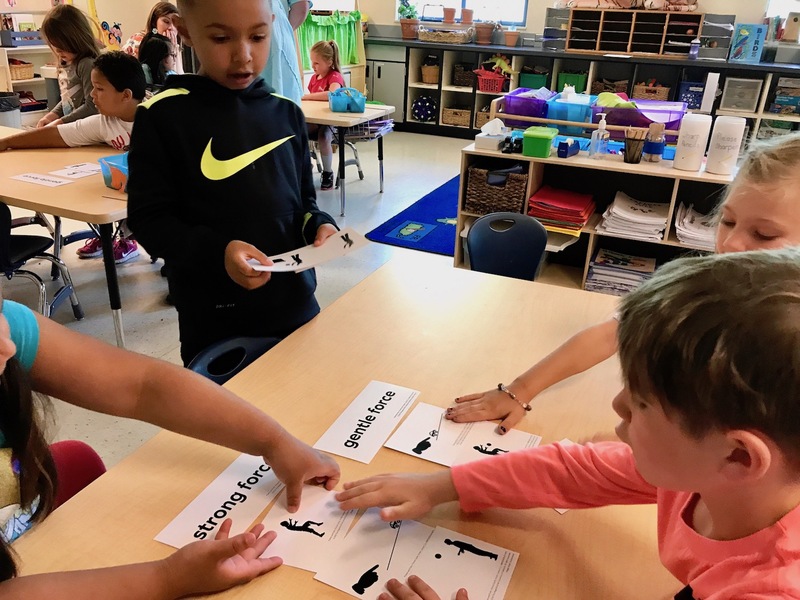 Next, students matched images of scenes — a toy car being pushed up a ramp or two people tossing a ball, for example — with the correct word identifying the type of force depicted: strong or gentle. After practicing as a class, kids broke into small groups to sort more images. At one table, four students worked together to quickly place all their image cards under the correct header. “He didn’t put that much force,” said Lorenzo Glasser, 6, as he placed an image of a boy juggling a soccer ball with his knees under the word “gentle.” How could Lorenzo tell the boy hadn’t used much force? “It made it [the ball] go not that far,” he explained. Sorting done, the class gathered back on the rug to go through the cards as a group and tell each other how they got their answers. 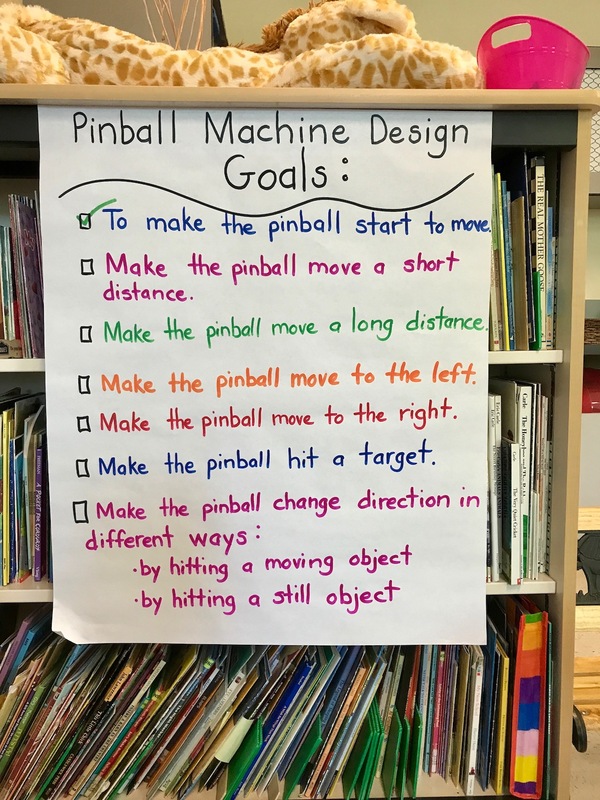 Then it was time to continue their ongoing experiment with forces by taking out their “pinball machines” — open cardboard boxes with elastic bands stretched across, which acted as launchers for tennis balls. “If you pull the launcher back really far, the ball can go a long distance,” Heidi Variz, 6, reminded the class before they got started with the next step in the experiment. What would happen if they used a shoelace, instead of their finger, to activate the launcher? 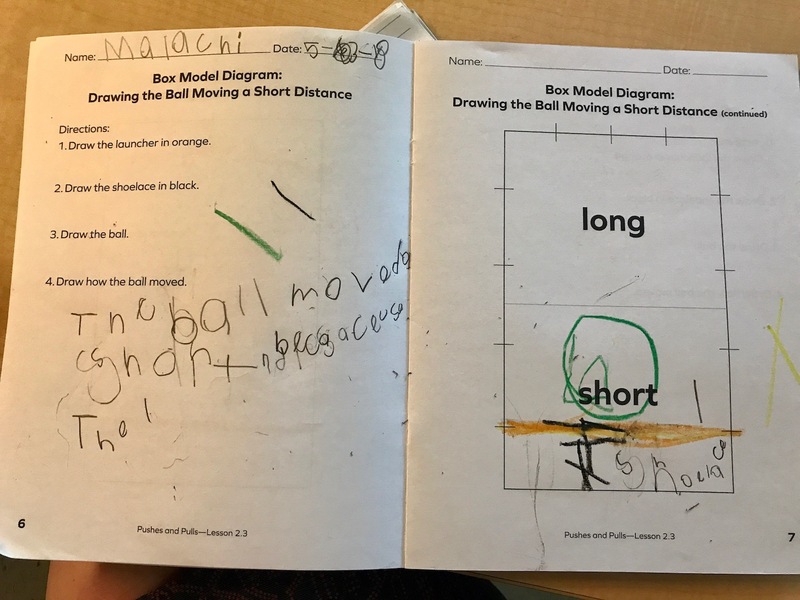 Learning more by trying new things is what Callahan loves about the NGSS-inspired science lessons she’s running in her class this year. Today’s lesson on force comes from Amplify Science, a curriculum developed by educators at Amplify, a curriculum vendor, and researchers at the Lawrence Hall of Science, a public science center at the University of California, Berkeley. 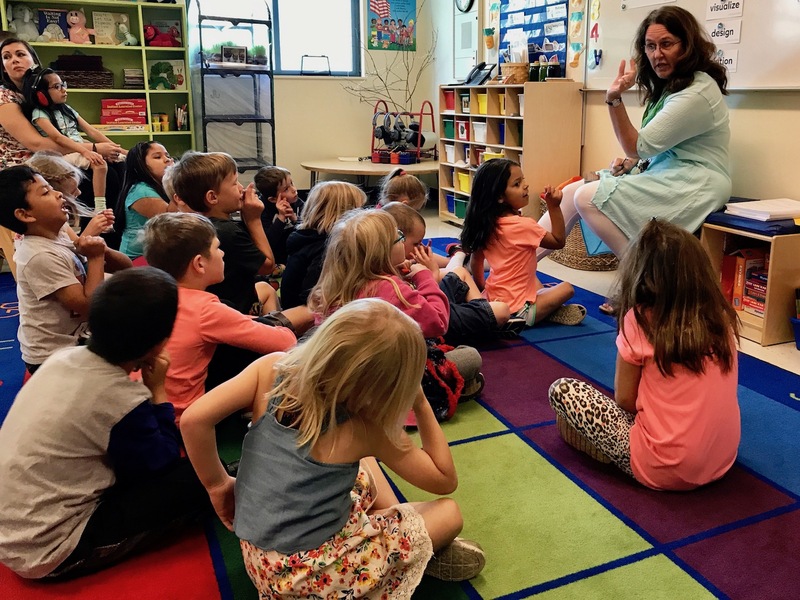 It’s one of three elementary school science curriculums Callahan is helping to pilot now that her district decided to re-commit to elementary science education. Callahan has become a particularly fervent believer in the power of science education in her classroom. In 2016, she was accepted as a trainer for the Oregon Science Project. Along with 200 other Oregon educators, more than half of whom were elementary school teachers, Callahan spent the 2016-17 school year learning best practices for teaching kindergarten science. In the summer of 2017, she passed that training on to 19 of her Redmond colleagues who wanted to learn more about teaching science in their elementary school classrooms. Getting students beyond activities like memorizing the stages of a butterfly’s lifecycle or learning the parts of a plant is just what NGSS is meant to inspire. The standards list scientific concepts and practices students should understand at the end of each grade level, as well as specific ideas they should know. Compiled by state leaders, the National Research Council, the National Science Teacher Association and others, the standards were warmly received by many educators when they were first released. Not everyone loved them though. Critics complained the standards overemphasize skills while relegating factual scientific knowledge to secondary importance. And some conservatives decried the standards’ references to climate change and evolution as so much political maneuvering. But Achieve’s Krehbiel, formerly a high school science teacher in Kansas, believes the standards can make a positive difference for students. Oregon educators are hoping that proves true here. The state, which ranked dead last for time spent on science in elementary school in 2009, is aggressively trying to get better. The Oregon Science Project was initially funded by a grant from the federal government and will continue with funding from the state and from professional development fees charged to districts. The state also published a science and math education strategic plan in 2016. Among other goals, the plan calls for increasing the time spent on science in elementary school to above the national average. Trecha, of the Oregon Science Project, said the state’s focus is beginning to make a difference, though she acknowledges there’s still a long way to go. When speaking with teachers from all over the state, Trecha said she heard that some elementary schools don’t have science as part of their weekly schedule and many districts don’t have an up-to-date science curriculum, although having one is required by state law. “We’ve asked [elementary students] to make things sink or float, but we haven’t asked them to make sense of it or explain it,” Trecha said. She said children should be asked to draw diagrams of floating objects, think about invisible forces like buoyancy, or wrestle with tricky concepts like density to deepen their understanding of why some objects sink and others float. It’s also important to do a better job reaching all students, Trecha said. Black and Latino students and students from low-income homes tend to perform less well on the national fourth grade science assessment. That pattern holds true in Oregon. Just 14 percent of Latino students, 10 percent of American Indian/Alaska native students and 23 percent of students who qualify for free or reduced-price lunch, an indicator of low family income, scored at or above proficient in science in 2015. (Not enough black Oregonians took the test to accurately measure the group’s performance.) In contrast, 37 percent of Oregon’s entire fourth grade population scored at or above proficient. These disparate outcomes persist through middle and high school, where girls also start to perform less well than their male peers. Against that backdrop, improving science instruction in districts like Redmond, where 74 percent of K-3 students qualify for free or reduced-price lunch and 18 percent are Latino, is especially important, Trecha would argue. 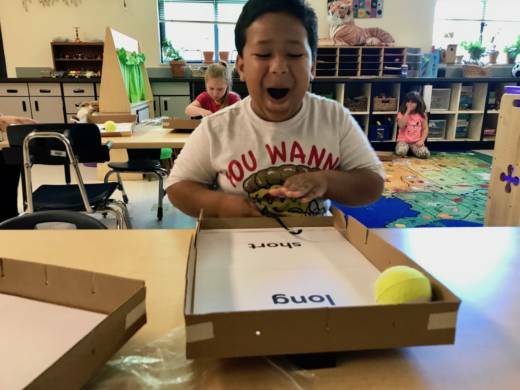 Back in Callahan’s classroom, Malachi Ballinger, 6, and Alyssa Akre, 6, are tugging on shoelaces now attached to their rubber band launchers and observing how the tennis balls react to the forces they are now exerting on them. “[Scientists] always say what happens,” Alyssa chimed in. “They say ‘because’ a lot,” added Kyah Higgins, 5. So, that’s what scientists do, but what do they look like?